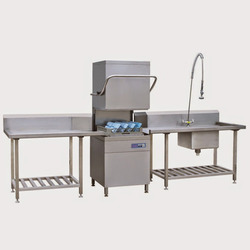 Manufacturer of a wide range of products which include hood type dishwasher. With the support of our skilled team, we bring forth Hood Type Dishwasher, in which the machine cycle starts automatically, on the closing of a door when setting into automatic mode. The pre offered dishwasher does not require any button pushing. This hood type washer has primary filter above the main wash tank water, which is below the wash basket. Moreover, this filter catches debris in the machine. The secondary filter filters small particles before they enter the wash pump. Looking for Hood Type Dishwasher ?